Which of these 5 is the starter relay? Last edited by dirty hands; 10-31-2016 at 10:27 PM. Thanks! After posting my question here, I asked a friend the same question and he agreed with you. I finished cleaning all of the connections from the battery to the wiring and from the wiring to the starter. As everyone was about to leave for school or work, I tried to start the engine and the starter or the solenoid went "Click-Click-Click-Click-Click-Click" and everyone left in utter disgust, but me. Well, I decide to test the relay 1, but after pulling the relay and before testing it, I tried starting the car without the starter relay. When I threw the ignition, instead of hearing "Click-Click-Click-Click-Click-Click", it made the same noise it had in the past just before the engine started. However, before the engine actually started, I returned the ignition it to the neutral position. Would a faulty starter relay cause the starter to go "Click-Click-Click-Click-Click-Click" when I try to start the engine? If I removed a faulty starter relay, would you expect the starter to operate correctly and start the car? Will the relay pass the continuity test that I will run in a few minutes? What is the purpose of the starter relay? I will be back after I check the starter relay. Thanks for your help and everyone who helps from this point forward. Last edited by gfr92y; 10-31-2016 at 03:05 PM. Reason: Correct the mistakes caused by a defective brains. 4) The starter relay solenoid is connected between any safety switch such as clutch or P/N switch and the ign switch. When the ign switch is turned to start. Power runs through the safety switch to starter solenoid to close the relay. The relay switch then sends power to the starter solenoid. 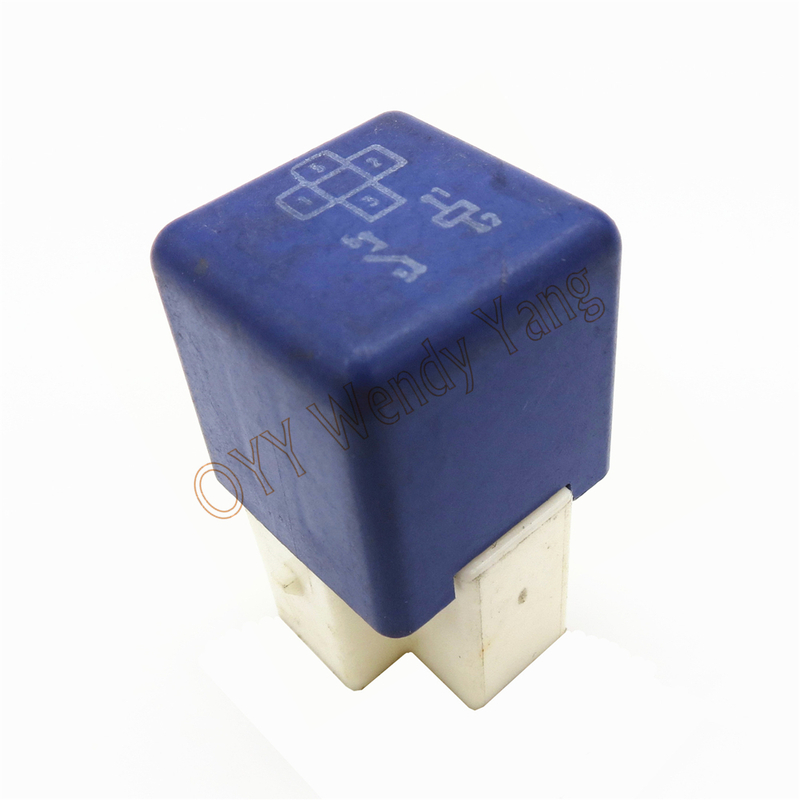 1) It is rare for a starter relay to fail. Typically if click, click the issue is the battery, battery connections, cable running between the battery and starter solenoid or the starter solenoid. 3) The easiest method to check the starter solenoid is with a volt meter. Find the SMALL wire going to the starter solenoid (might be black/red). Connect volt meter to the wire terminal. When the ign switch is turned to start, there should be constant 12V at the terminal. 2) If the starter relay is removed, the starting circuit should not operate. 5) Only you know this as only you can give meaning to it. My son tries to start the 2007 Camry (4 cyl) and hears, "Click - Click - Click - Click - Click - Click" each time he attempts to start the car. In desperation, he attempts to start the car by rapidly turning the ignition key on and off until the car starts and he drives it home. I test the battery with an anolog ammeter and the battery reads a little more than a hair over 12. Being over-confident in my ability to diagnosis the problem, I remove the OEM starter and trek off to NAPA. NAPA could not test the starter, so I go to Advance Auto and Autozone; both inform me the starter tested fine. I return to the Camry, clean the battery posts/connectors and the connector on the solenoid that is attached to the starter and reinstall the original starter and Click - Click - Click all over again. Two hours later they say they cannot get a reading on the relay. So they give me an identical new free relay and send my on my way. 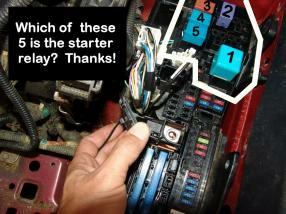 After I install the new "starter relay", the original starter clicks. I then install a new starter and it clicks. I then pull the #1 relay and turn the ignition and the starter clicks again. Can I conclude from Item 12 that Relay #1 is not the starter relay and that one of the other four relays are the starter relay? ... And should I continuity test them? ... And is there anything else I should do or consider? I was just curious what the outcome of this was. Have an '03 Camry with similar symptoms. Haven't replaced any relays yet, but have one ordered and this will be my next step. Quick Reply: Which is the starter relay?